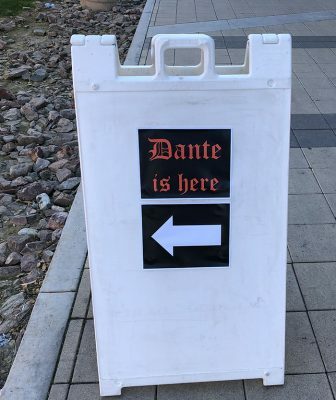 The sign, “Dante is here,” was both literal – pointing to a marathon reading of Dante’s “Divine Comedy” — and metaphorical — indicating that Dante’s words are as relevant in 2019 as they were when he wrote them in 1320. 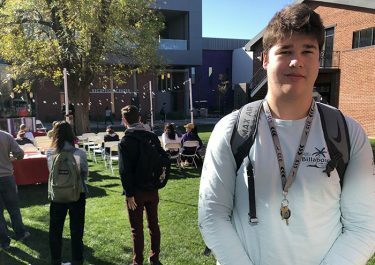 Hearing the words of Dante over the microphone, from the chilled Friday morning air through the warm afternoon and deep into the starry night, was exactly what Grand Canyon University student Max Likkel pictured when he anticipated college life. The sign is not only directional, metaphorically it is saying that Dante’s words live on, even though he died in 1321. 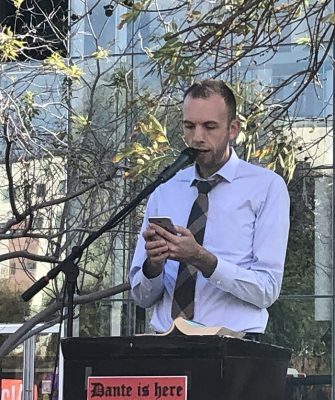 “It is something you see on a college campus, just a book reading and kids walking by, and now I am in it,’’ said the freshman from Lynden, Wash., whose class met on the lawn between GCU Arena and the English building to hear a few of the 100 cantos of the Italian poet. 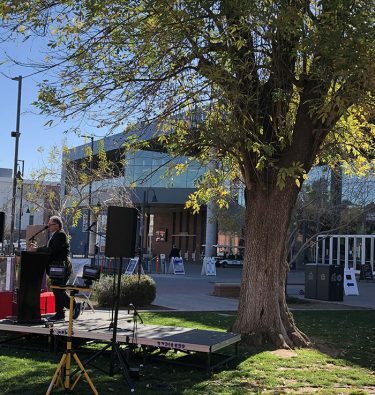 Readers, standing under what is believed to be the oldest tree on campus, a shamel ash, took turns vocalizing the three-part epic about the afterlife. In “Inferno,” ancient Roman poet Virgil guides Dante through the nine circles of hell, where they meet sinners who pay the consequences for their sins. The “Purgatorio” features a seven-layer — for the seven Deadly sins – mountain-shaped holding place, where penitent souls purge their vices. In “Paradiso,” Beatrice, a Christlike figure, guides Dante through heaven. Dr. Jonathan Olson, the young man in the front row wearing a scarf and a belt from Florence – Dante’s hometown – is surrounded by translations of the “Divine Comedy” and two lunches expertly packed by his wife. The assistant professor is the heart and soul of this marathon. For more than 12 hours, he listened intently and joyfully, and helped readers with difficult pronunciations. With the help of Professor Dr. Diane Goodman, Olson introduced the marathon oral reading concept last year with Milton’s “Paradise Lost.” A graduate of Biola, a Christian university in La Mirada, Calif., Olson gained a classical education in England, earning a master’s degree in English at the University of Birmingham and a doctorate in English from the University of Liverpool. He began teaching English at GCU, including Honors College classes, in fall 2016. Dr. Jonathan Olson, the founder of the Dante marathon, passionately reads. As Elliott pointed out, the rapid growth of podcasts is indicative of the return of the oral tradition. “I am really elated to see it coming back,’’ he said. For Olson, co-editor of “Milton in Translation,’’ which won the Milton Society of America’s Irene Samuel Memorial Award, the rhythm and rhyme of poetry can be overlooked in silent sustained reading. 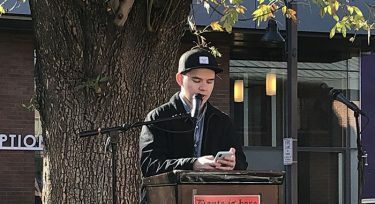 “Epics were eventually written down, but hearing them read and vocalized brings out a lot of the qualities in poetry that can only be heard if they are spoken,’’ he said. I stand prepared for Fortune, come what may. Josh Capatch, a freshman from Northwest Christian High School, provided a passionate reading. “It is cool to hear sayings that are still around from something written long, long ago, ‘’ said Josh Capatch, a freshman from Phoenix’s Northwest Christian High School. “I have a lot of peers who said they really love these books, so I thought it would be a good opportunity to come and read,’’ he said. Most students and professors read various translations. The Mandelbaum translation on the Columbia University web site was a favorite. There were 50 readers in all, including 38 students. Faculty, instructional assistants and local high school teachers also were among the readers. Max Likkel, a freshman from Lynden, Wash., read Dante in high school and enjoyed the refresher. 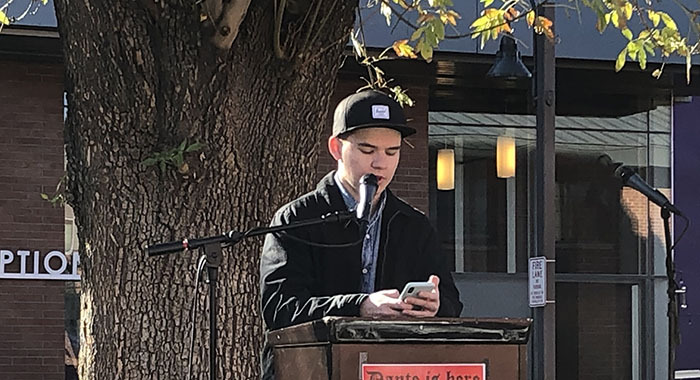 Olson started off the event by reading Canto 1 of “Inferno.” Later, he proclaimed Canto 21 and Canto 22 in “Purgatorio,” and throughout the day he filled in whenever a sign-up slot was empty, lending an expressive voice that conveyed familiarity and understanding. “We started seven minutes late, but by Canto 32 (in “Inferno”) we were back to the original schedule because the readers have been so good,’’ Olson said. Noemi Sanchez signed up for 10 consecutive cantos – more than one hour of continuous reading — and helped set up the seating area. “Her reading was very ambitious and appreciated,’’ Olson said. Although she is a government major with an emphasis in legal studies, poetry is her passion. As a student at Miguel High School in Tucson, she read the “Inferno.’’ Later, she read the other parts on her own. Likkel, who read Dante for several homework assignments as a student at Lynden Christian, applauded the spreading of his word. “I know a lot of these kids haven’t read it before, so I think it is good for them to hear it,’’ he said of the students in his communications class, who listened to several cantos over a 45-minute period. For Brian Pharies, who read Canto 16 from “Inferno,’’ reading in public is a pleasure. The political science major has read scripture in large church settings. Frank Hodges, an adjunct professor in English, proclaimed under the shamel ash tree. As darkness fell and the heavenly journey of the “Paradiso’’ proceeded, Olson was fascinated again by the brilliance of Dante.